Vogue Wedding Show, The Ultimate Destination for Indian luxury weddings, enters its third year (to be held on Aug. 7th-9th, 2015 in New Delhi) and last week, designer Anita Dongre treated us to an exclusive sneak peek to her bridal couture to be showcased at the VWS. 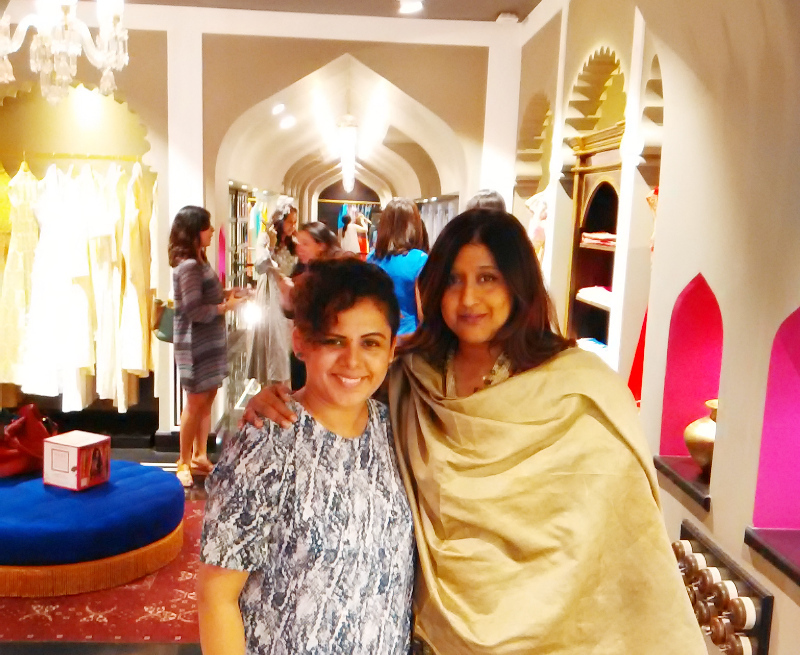 While she spoke about the bespoke bridal trends in a tête-à-tête with Vogue India Editor Priya Tanna, I too stole a few exclusive moments with both Priya and Anita to understand the collection as well as the show in detail. Here is what they shared with us. Vogue Wedding Show is the one-stop-shop for the bride. Its the ultimate in luxury because it brings to you the best in fashion, beauty and everything that a bride and groom would need. With time, we have got a stronger understanding of what our clients want so now the show is every more tightly curated. The entire team at Vogue makes a very conscious effort to bring the best of bridal service providers from across the country through this show. Last year we had Master Classes that were workshops conducted by experts in the bridal field and these workshops were a huge success. This year we have increased speakers for the workshops and are also bringing ‘Saree Pavilion’ where designers like Ekaya, Lakshmi and Swati & Sunaina will be showcasing their best designs. So its the best brands with the best mix and its only getting better. Is when the brides come with their families and along comes a lovely mix of traditions and family dynamics. The whole environment at the VWS is dramatic, endearing, filled with intimate moments and is a great playground to see traditions come alive. You can register here to attend the Vogue Weeding Show. At the heart of it, the collection is about gotta-patti work, a craft that I mainly use for bridals. What is also exciting about the collection this season is that we’ve included a beautiful hand-woven line from Banaras where designs created by us have been woven by a group of 9-10 weavers. The endeavour is to keep giving them work to make this model (of working with weavers) sustainable. We have also come up with a highly contemporary line in gotta-patti with pieces like long jackets, palazzos, slim cigarette pants, etc. that are extremely versatile. I always bear in mind that my pieces are adaptable and can be worn as separates because I like the bride to wear my designs in different ways. My bridal collections have outfits for all occasions right from mehendi to sangeet to wedding and cocktail. One of my favourite piece is a pair of shorts for mehendi done with gotta-patti. The most special part is when your months of hard word comes through and is apprciated by people. Last year when I participated in VWS, it was also the year I opened my first bridal store in Delhi and the response was incredible. Inspite of the fact that Delhi is known to go for bling, the brides who came at the VWS loved my work and recognized my designs and sensibilities which are not typically bling. At the same time, since I take care of the entire business, I’m hardly present at the store and all styling decisons are taken by our stylist. VWS is one of the rare occasions when I interact directly with the clients and spend time with them and their families. All this makes the show very special to me. I would suggest grooms to incorporate print in their outfit. We have done a line of beautiful Rajasthani prints which grooms should check out. It will be a nice addition to solid statement pieces in their collection.